Despite the enormous risks female journalists face in Afghanistan just doing their jobs, there are still too few opportunities for them to find work. Now, Afghan women aren’t waiting for opportunities to present themselves, they’re creating their own. 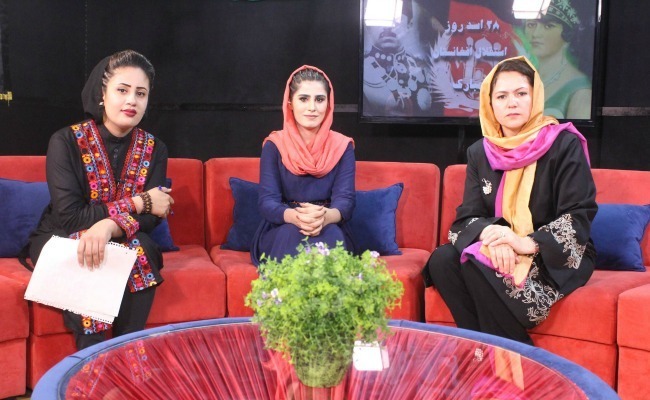 Afghanistan’s first TV station for women and by women launched three months ago in Kabul and has since sustained impressive ratings. Fifty women operate Zan TV (“women TV” in Arabic), all between the ages of 17-28. Half of the women are trained journalists, the other half are learning on the job. The station employs ten men to teach women skills like film editing and camera operation, but the entire on-air team is female. In a saturated market, women journalists have a hard time finding work and an even harder time covering issues that matter specifically to women. “Many trained journalists are jobless because most TV stations won’t employ women, so we do. We also want to train young women who might not have access to education because of where they live or their family,” says Nasrine Nawa, Zan’s director of news programming. The station’s founder, Hamid Samar, came up with the idea while looking through job applications at another station and saw that women were applying for anchor jobs despite cultural taboos. He told Reuters he felt that women just needed more opportunities to show up, work, and prove themselves. In a country where women were banned from education not long ago, Zan’s very existence is revolutionary, but its choice of programming pushes boundaries even further. Targeting an audience of millennial women, the station covers topics critical to its audience that most competitors would ignore, and does so through an unabashedly feminist lens. In addition to these topics, Zan also runs a daytime show on cooking healthy meals, because Zan knows an interest in politics is not mutually exclusive from an interest in cooking and vice versa. Khatira Ahmadi, a 20-year-old producer at Zan, said that many women in Afghanistan are not aware of their rights and that Zan can help raise women’s voices to enable them to defend their rights. Along with that mission comes a pretty significant risk. Some of the women working at Zan have received threats against themselves or their families. Last year was considered “the bloodiest year ever” for Afghan journalists. In 2016 alone, 13 journalists were killed, 10 of them by the Taliban. After Syria, Afghanistan is the second-most dangerous country to be a female reporter. Reporters Without Borders launched a center earlier this year to protect the country’s 300-400 female journalists. Still, women’s participation in journalism and media is growing and they’re using their position to empower other women, even if they have to risk their own lives. Zarghoona Hassan founded Radio Shaista, a radio station that talked about empowering women and women’s rights. She fled after the Taliban accused her of converting listeners to Christianity and set a date for her execution. She’s had to shut down her station twice to evade them. In May, Fatana Hassanzada founded Gellara, Afghanistan’s first women’s lifestyle magazine. She wants to portray Afghan women “as human beings” rather than only victims. Afghanistan’s female journalists are bravely carving out a place for themselves in the country’s male-dominated media landscape and it doesn’t look like they’ll let anything stop them.